Kiss is one of the world's most successful rock bands, with at least 3,000 licensed products. It has pitched such things as Kiss Kondoms, Kiss Kaskets (really) and the Kiss Visa card. The band's front man and co-founder, Gene Simmons, claims that Kiss can make $1 million or more a show. Its fans are rabid and have been since the group formed in 1972 in New York. Wearing a Kiss T-shirt is one thing, but many hard-core fans have decided to show their allegiance more creatively, as in the photo above. Netherlands KISS fan 'Necramonium' has made a great three part film called "The Evolution Of KISS". Necramonium writes on his Youtube page: "I made these video's to show the changes that KISS underwent when they transformed from a small club band to a million record selling stadium filling act. Most attention goes to their costumes and music on how they changed in the years". It's amazing how dedicated KISS fans are to the band and level of work the fans incorporate into their homages. Check out his webpage for more great KISS related video's HERE. Get your copy today HERE. "Sonic Boom" hits store shelves on October the 6th. 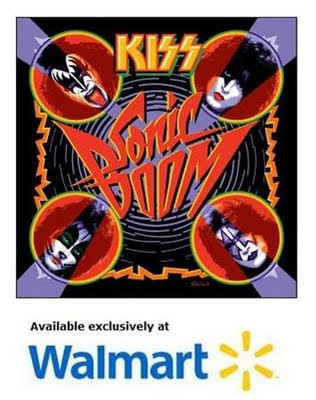 The 3 Disc Set, 2 CDs, and DVD set wil be sold exclusively at Walmart for $12. 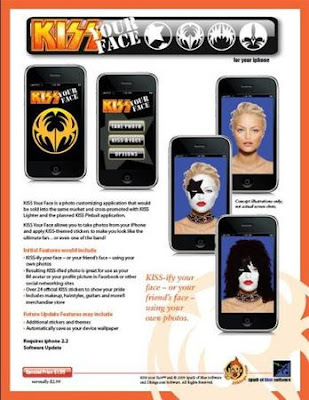 KISS Your Face is a photo customizing application that would be sold into the same market as the KISS Lighter and the planned KISS Pinball application. KISS Your Face allows you to take photos from your iPhone and apply KISS-themed stickers to make you look like the ultimate fan...or even one of the band! - Includes makeup, hairstyles, guitars and more!!! KISS "Modern Day Delilah" has hit radio this week and is having strong showings in some markets across America, including being the number one phone request at WDHA in New Jersey, according to FMQB. The hard rocking Paul Stanley tune is the first single from the upcoming Sonic Boom CD and continues the tradition of KISS getting snubbed by radio. This is the first new material in 11 years and will be sold in the U.S. and Canada exclusively at Walmart, Walmart.com and Sam's Club retail locations. SONIC BOOM, produced by the band's Paul Stanley in Los Angeles, is the centerpiece of a three-disc set that also features a completely re-recorded greatest hits CD as well as a live DVD shot in Argentina during the band's recent, record-breaking KISS ALIVE 35 South American tour. The CD set will retail for $12, with pre-orders starting in September on Walmart.com. It took a while, but it seems that the entire Simmons clan has signed up to Twitter.com and are "tweeting" to fans and friends. Gene Simmons recently wrote on his Twitter page: "My son finally caved to the pressure, and made a Twitter account". So if you're a big fan of KISS and the A&E T.V. show 'Gene Simmons Family Jewels', then sign up to Twitter today and follow the Simmons family!